Scooter's World: Trains, Trains, TRAINS! As Patrick has gotten older, his interests have developed even more (Duh! Did you know this happens when kids grow up?! Ha!). 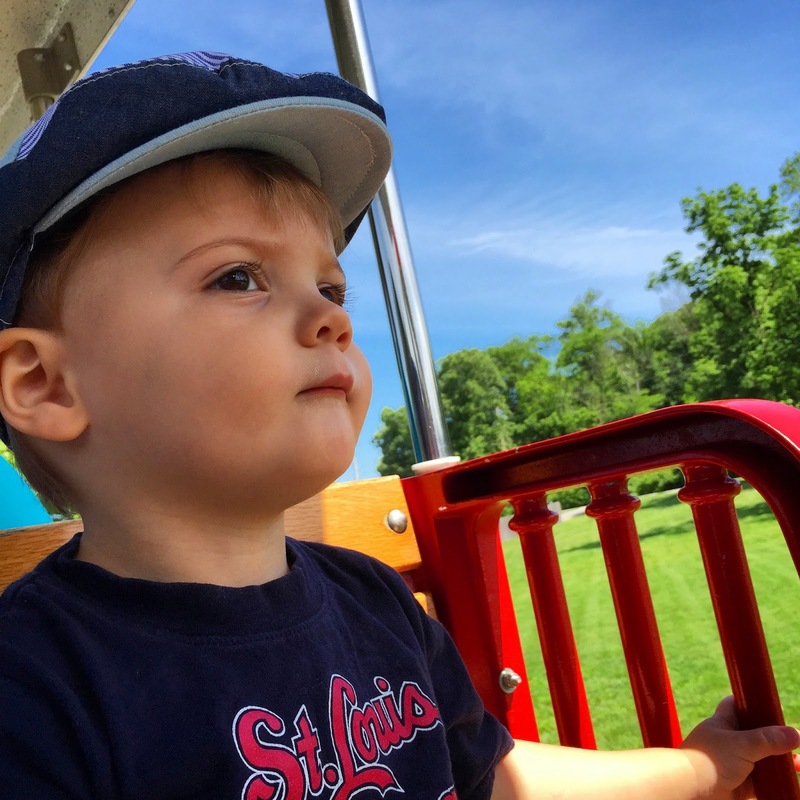 Lately, well, for the past several months, this kid is OBSESSED with trains. 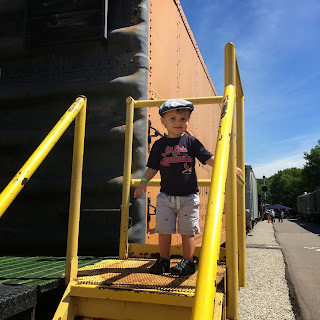 Like absolutely loves all things trains: toys, real trains, train shows, and trucks that he thinks are trains. For his birthday he got a ton of Brio trains (well more--his awesome cousin Jack hooked him up with all of his trains from when he was a little guy) and a big train table to play with them on. He demands to take at least 7 trains to bed with him for naps and bedtime (not kidding). He always has at least one on him at all times, especially in the car. He can hear a train whistle from a mile away. He flips when we tell him we're going to the train store or when we approach a train out driving. He is obsessed. He loves his choo choos. Today we ventured to the Museum of Transportation with my aunt Kate. Shockingly, I haven't actually been there to visit (aside from some events) since I was a little kid! Oh boy, a lot has changed! 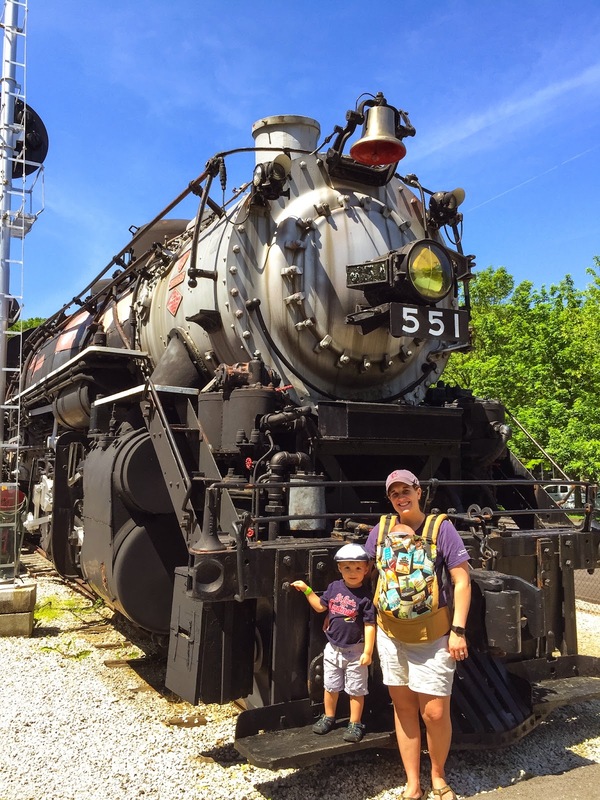 It is AWESOME, and totally a little train lover's heaven (and, much closer than the Zoo--it's got a mini train just like the Zoo does!). In the lobby there was a big train set that Patrick watched go around and around like 100 times. I'm pretty sure he'd have been content with that train the entire time. Ha. 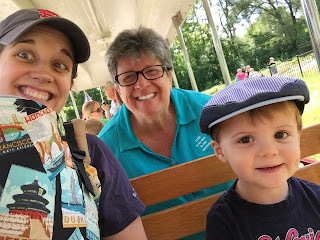 Well once we got him away from the train in the lobby, we headed for the mini train that went around the entire museum. OMG. He freaked, much like he did at the Zoo! He loves trains so much and loves riding them even more--so once we got moving, he was in a choo choo trance and in complete heaven. 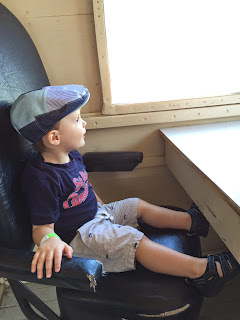 Once we rode the train around twice, we headed up to see the real cars and trains. Again, this little boy was in heaven! He must've pointed and yelled "choo choo!" a thousand times. It was so cute to watch him light up when he saw a new train or car. Gah, mommy heart melting. The last thing we did was hit up the Creation Station inside the museum for some playtime for Patrick. 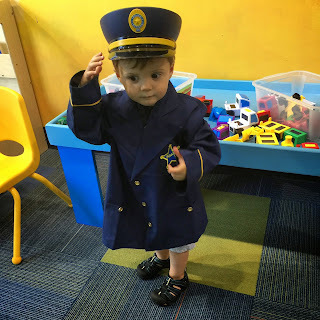 He got to dress up (a little skeptical of that...) and play with the toy trains, cars, and kitchen stuff. He was in heaven! We actually left the Creation Station early (we had an hour pass) so we could ride the train again before we left to get some lunchies.